I’ve just received a newsletter from my long forgotten account with Multiply, the Microsoft-backed social network site (SNS) that was regarded, in 2006, as the MySpace killer. Once a very popular SNS, Multiply was rapidly surpassed by the Facebook avalanche, the MySpace musical boom and wave after wave of social apps such as Twitter and Last.fm. It’s heavy secured, heavy programed, heavy to load. But it’s still there, and now plans a comeback. In their highly informative newsletter they explain how innovative it is now to post your updates from Twitter, Facebook and other places inside your firewalled profile. They even are gentle enough to explain how you can save space to post entire URL’s to that narrow 140 character limit you got from those grumpy APIs. Isn’t that nice? Read what they have to say. Do you still remember your Multiply login? Multiply members no longer have to choose between sharing securely with the people they know and extending the audience for their media. Now you can have the best of both worlds, sharing your content all over the Internet without having to visit another service to do it. 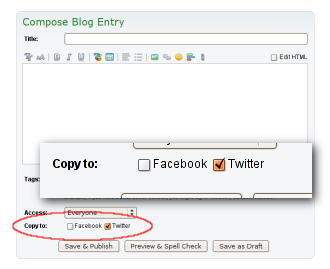 Set-up is easy: simply check the “Twitter” or “Facebook” box when posting content to Multiply and we’ll walk you through the process. Once you’ve done that, cross-posting to these services when sharing on Multiply is just a simple checkbox away. You can even cross-post a Multiply QuickNote to let people on these services know what you’re doing! Owing to these services’ limitations, we made sure to include something sure to make even the most 140-character-limit-savvy sharer happy: our very own built-in URL shortener – http://mltp.ly/ – so that your posts always link back to the original content on Multiply. Don’t worrying about accidentally going over these services’ character limits, either… we’re watching out for you. If you happen to know anyone who uses those services, but doesn’t use Multiply, let them know they can now take advantage of Multiply’s full-service media solution (share safely, store permanently, create beautiful photo products) while still sharing with the contacts they already have on Facebook and Twitter. Over the years, we’ve had great opportunities to get to know many Multiply members, both via our interactions with them though customer service, as well as through the content they share in groups. Now, we’d like to get to know everyone, and have put together a survey to help us better understand the people using Multiply, including their interests and feelings on a wide range of subjects. If you’d take the survey, we’d greatly appreciate it… and will extend to you a coupon for 50% off the purchase of a Multiply Photo Book! Sempre admiro e invejo uma campanha bem planejada, bem executada e que não abusa de sacadinhas… daquelas que não “precisa explicar a piada”. Esta campanha do Turkish Economic Bank, afiliado ao BNP, cumpre todos esses requisitos para anunciar sua linha de crédito. Um produto banal, que toda casa bancária de meia-pataca tem. Logo, um daqueles briefings que fazem os criativos revirarem os olhos e correr para suas manuseadas edições da Archive e dos Anuários. Mas a execução da Medina Turgul DDB, de Istambul, foi genial.